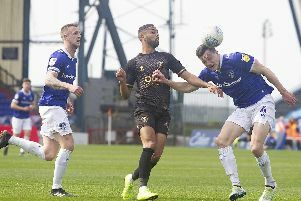 Steve Evans watched Saturday’s win over Carlisle from the directors’ box as he served his one-game FA ban – and the Mansfield Town boss admitted he enjoyed the view. Evans and assistant Paul Raynor are well known for their noisy, enthusiastic showings from the dug-out. But, forced to watch the game from a higher position as punishment for his argument with officials at Grimsby, Evans said: “Obviously there is a big advantage being up there as you can see the game in a very strategic way. “Then, tactically, you can communicate back with the bench. “It is something that I, and all managers, wish they had it in them to say that’s where I am going to sit. But I suppose the passion and the heat of the battle gets you down. “But it’s been good as you do see a game that’s quite different. I will learn from being up there. “I can remember Steve McClaren in his first spell at Derby used to watch an hour and come down. He told me how it worked for him. He added: “It is something that worked on Saturday. Communication is always a problem as there are always delays. “But in respect of what you see, you do see a much better game and a much better tactical spectacle. It’s what I have always said about supporters, who are in higher vantage points – if they make opinions, you should always listen. “We would all agree it’s not a great vantage point on the sidelines, seeing a level pitch as opposed to looking down on it. Stags fans in the Ian Greaves Stand were treated to the full volume of Evans shouting instructions at Matt Green.